The marathon is this coming Saturday so if you are around D.C. don't be surprised to see 12,000 runners taking over the streets. This is the biggest field for the race so far in it's young history and is split between the marathon and the half-marathon. I'm guessing that there is about 4,000 in the marathon. The race takes in six of the eight wards in the City and so if you wanna get out and watch here the map. 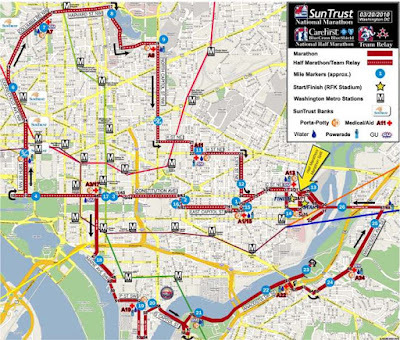 The race starts at RFK and then takes a general figure of 8 loop taking in the north of the City first and then heading south and over the river. It should be a good race and it is really the first time that I have run in a "larger" event. I did this race back in 2008 but it was significantly smaller then. Although larger races lose some of the "homely" feel they can definitely make up for it in terms of quality of field, which for me hopefully means a faster race. The marathon race has some great athletes in it this year and if all goes to plan I can keep on their coat tails and run to a PB. Marathon running is a funny sport and in many ways it is so very different from Ironman racing. As Frank Shorter(1972 Olympic marathon gold medalist) once said "You have to forget your last marathon before you try another. Your mind can't know what's coming." And Rob de Castella, winner of the 1983 World Marathon Championships "If you feel bad at 10 miles, you're in trouble. If you feel bad at 20 miles, you're normal. If you don't feel bad at 26 miles, you're abnormal."